We are located at 77 Midway Church Road off of Highway 98 going west towards Columbia. 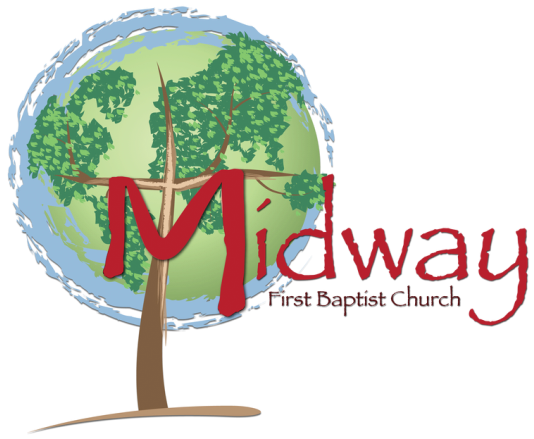 Our worship services begin at 10:45 a.m. We recommend arriving 10 minutes prior to start to get settled in. There is parking on each side of the building as well as in front of the building. We do have handicap spaces available. We are wheelchair accessible as well. Our service typically lasts one hour and 15 minutes. You are welcome at Midway just as you are. We have members in coat and tie, members in jeans and t-shirt, and everywhere in between. We meet to worship the Lord and fellowship with other believers. We believe that it’s the attitude of your heart that matters to God, rather than your physical appearance. During worship, we sing several hymns. We have a choir, organ, and piano. We also have special music offered by soloists and the choir. The pastor preaches expositional sermons that are designed to draw the person closer to Christ and experience Him in their daily lives. We have Sunday School classes for all ages and for all walks of life. Everyone, regardless of age, is welcomed and encouraged to attend Sunday School for community, prayer, and Bible study. What is available for children during worship/Sunday School? Children are very important to Jesus, they are very important to us! We offer Children’s Church for kids ages 3 through Kindergarten during our worship services. They will experience a time of activity and Bible study on their level. We encourage children to sit with their families. We believe even young children can begin to grasp the worship service and that they learn more quickly to sit still and participate when they are welcomed into the sanctuary. We also have a nursery for infants to 2 year olds for both Sunday School and Worship. The ushers will be glad to direct you to these locations.